Here we are - the final post. For those of you who have been reading my articles each day, I'm sure it has become clear how much fun I had this season. The runway between shows was full of warmth, connecting with current friends, making new ones and an abundance of photo ops. Those there every day worked hard to come up with interesting styles and a few rose to the top for knocking it out of the park with each outfit. The only downside today was a case of withdrawal and feet slightly swollen from wearing heels for 7 days. 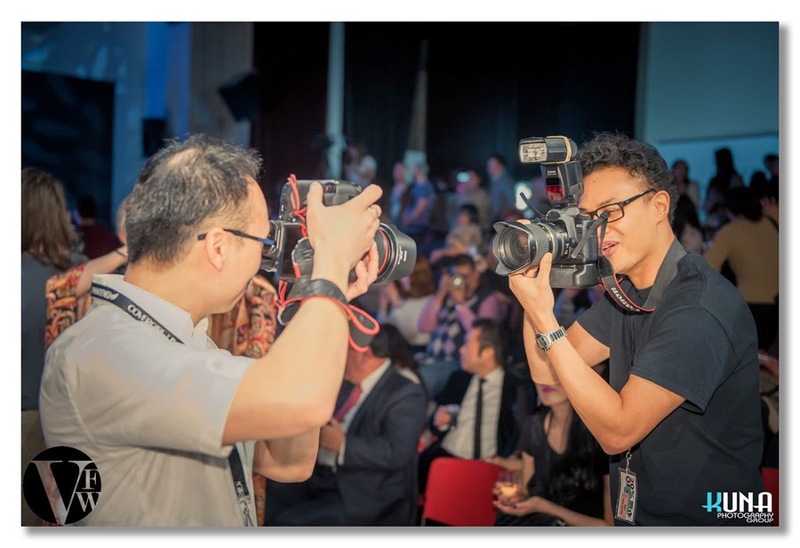 My favourite image from Day 6 I am titling Dueling Photographers - Ed Ng on left and ?????. I tried taking the pic, but Kuna captured the moment better. The photogs covering this event are truly packed into the pit during shows. How they keep from bumping into each other while shooting I have no idea. Then they run out during breaks trying to capture great candids of what the event was like and the people in attendance. Kudos to each of them for their hard work. Special thanks to the four I personally worked with - Peter Jensen, Kuna Lu, Ed Ng and Norm Lee. Wish I had taken a candid of the "team". 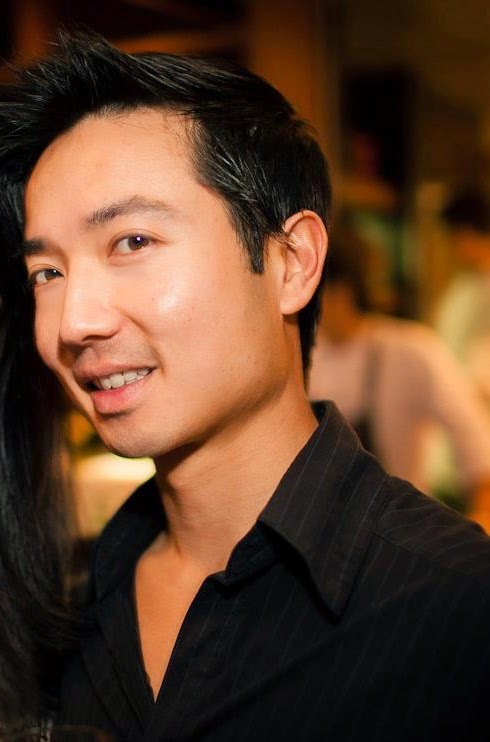 I wanted to mention one last sponsor who helped to make this event possible - Kean Tan of NexusV Inc. and MODI$club. This company powered the VFW branded mobile site and sponsored both the Txt2Win Contest (won by Ferial Sultanali) and the Txt2Vote People's Choice Designer contest - both new this season. Tan was kind to share some thoughts on being involved this season - "We've been very excited to work with VFW to bring their branding and marketing to the forefront of international standard via technology. There have been great reviews on the mobile site we've designed and developed - easy to navigate and slick looking (simply visit Vanfashionweek.com on your phone to get to the mobile version). The Txt2Win & Txt2Vote campaigns have also been a success helping VFW build up a mobile database for the seasons to come." The looks in her current collection were easy to wear, loose in fit and other than the bright orange boxers, in mostly muted fall colours. One sign of great design is when the models seem to enjoy wearing the looks and these men obviously did. When they came out as a group at the end of the show they were full of energy and really played it up with the crowd. I wish she had accompanied them to the end of the runway. Hoping this designer comes back again as after 2 such totally different collections, I'm intrigued to see what she will bring to the runway next. Korean designer Soojin Lee was next on the runway. I have struggled to find much in the way of background on her, but here is a bit. She originally studied art but after deciding to pursue fashion, moved to London - where she still resides - and in 2010 earned a BA from Central Saint Martins. Resume highlights include impressive fashion brands such as Alexander McQueen, Hussein Chalayan and Emilio de la Morena and Lee was one of the international emerging designers featured in the iFashion Network sponsored iFashion Week 2012 held in New York. This collection featured a great selection of separates - pants, skirts, blouses, jackets and vests - as well as a few dresses. What caught my eye during this show was the use of print. One I thought worked particularly well was a printed cape over a solid colour dress with a touch of print trim near the hemline. I will add a picture of it when it becomes available. This was a first showing for this designer at VFW. Kudos! There was an understated touch of elegance to the next show - Evolèt - by designer Jercy Gutierrez from Peru. He moved to Paris at a young age to immerse himself in the world of fashion, acquiring knowledge and skills needed to enter the luxury industry. After working as creative director for Barbara BUI Groups, a commercial buyer for the Kaburi Boutiques and becoming a member of the commercial directors at the House of Prada, the designer discovered his love for the creative side of fashion. Returning to Peru, Gutierrez launched a brand to reflect his own vision - a line of truly beautiful clothing for the refined, elegant, sophisticated woman. I am a fan of beautiful fabric, elegant silhouettes and couture tailoring. I was enthralled from opening to the final offering. This collection - called Amazon Woman - held all 3. From his press release, "In this collection I try to represent the femininity and the power that identifies them as Amazons." What we saw on the runway was also the perfect example of less-is-more. Each look was subtle and yet eye catching. Each exuded a rich, subtle elegance. The prints in particular were well chosen to show a range from a little more edgy as in the pants bottom left, to those show in the images above. Nothing popped out though - it all blended seamlessly into one beautiful flow. The other note I wanted to make was on the mix from soft, draping satin to the unique cropped knits - great mix of textures. I can only hope Jercy Gutierrez returns for another season. I was entranced. And I apologize. He was across the runway from me for several days and had I known who he was, I would have introduced myself. I have no idea how to even start this write-up. Noe Bernacelli is another offering from Peru where obviously couture has taken a strong hold. He is also one of my favourites from last season where he showed 2 collections. You can read the review HERE. I was so impressed I also wrote an article for Raine Magazine in New York. How do you follow up??? For those who were not here last season, The designer began a love affair with art at the tender age of 14 that lead him to study at the Carlo Esciccoli Fashion Design Institute in Milan. He returned to Peru six years ago, but the influence of Italy is still apparent. After last night, I can honestly say that is an understatement. Bernacelli is a master of haute couture construction. This season he only showcased his beautiful dresses and gowns. The designer's application of detailing on sheer fabric is phenomenal. It never looks like something is added, every intricate moment is a seamless part of the overall look. His blend of individual elements into a perfect final work is among the best I have ever seen. He is the only designer who had me entranced by a beige gown - not easy to pull off in the luxury sector. The collection offered satin, sheers, lace, feathers, pastels, vivid red, burgundy and black in varying range of silhouettes. My favourite hands down was the black gown in the top row of images on the right. It took my breath away. I am forever a huge fan and hope he continues to return to the Vancouver stage.